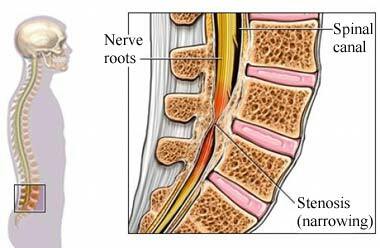 Spinal stenosis is a narrowing of the spinal canal. The spinal canal is located in the backbone. It is a small space that holds the nerve roots and spinal cord. If this space becomes smaller, it can squeeze the nerves and the spinal cord. This causes pain and other symptoms. Stenosis can occur anywhere along the spinal cord. It is most common in the low back (lumbar) region. Special exercises can help stabilize the spinal cord. Exercise can increase muscle endurance and mobility of the spine. This can relieve some pain. Sometimes exercises are ineffective against spinal stenosis. Wearing a corset or lumbar brace can help stabilize the spine. This may relieve pain. Surgery is reserved for severe cases. Decompression laminectomy —This is the removal of bony spurs or increased bone mass in the spinal canal. This can free up space for the nerves and the spinal cord. Spinal fusion —This is when 2 vertebrae (back bones) are fused together. This will provide stronger support for the spine. This is almost always done after decompression laminectomy. There are no guidelines for preventing spinal stenosis. Delitto A, Piva SR, Moore CG, et al. Surgery versus nonsurgical treatment of lumbar spinal stenosis: A randomized trial. Ann Intern Med. 2015;162(7):465-473. Kovacs FM, Urrutia G, Alarcon JD. Surgery versus conservative treatment for symptomatic lumbar stenosis: A systematic review of randomized controlled trials. Spine. 2011;36(20):E1335-E1351. Lumbar spinal stenosis. EBSCO DynaMed Plus website. Available at: http://www.dynamed.com/topics/dmp~AN~T114133/Lumbar-spinal-stenosis . Updated October 26, 2015. Accessed September 1, 2017. Snyder DL, Doggett D, et al. Treatment of degenerative lumbar spinal stenosis. Am Fam Physician. 2004;70(3):517-520. Spinal stenosis. National Institute of Arthritis and Musculoskeletal and Skin Diseases website. Available at: http://www.niams.nih.gov/Health%5FInfo/Spinal%5FStenosis/default.asp. Updated August 2016. Accessed September 1, 2017. 12/17/2013 DynaMed Plus Systematic Literature Surveillance http://www.dynamed.com/topics/dmp~AN~T114133/Lumbar-spinal-stenosis : de Schepper El, Overdevest GM, et al. Diagnosis of lumbar spinal stenosis: an updated systematic review of the accuracy of diagnostic tests. Spine (Phila Pa 1976). 2013 Apr 15;38(8):E469-81.